Like many kids, I faced instances of bullying while going through the awkward preteen and teenage phases that are all too familiar to each of us. Whether targeted because of my high-sounding voice or the acne that took over my face throughout middle school, bullying broke my heart and slowly transformed me from an outgoing, confident young woman to a shy, quiet girl afraid to speak up in class or meet new people. Though my confidence has rebuilt itself over the years, and I've been fortunate to always have the support of family members and friends who loved me no matter what, the memories come back at times to revive feelings of insecurity and fear. To this day, I still hate public speaking, and still feel self-conscious whenever I'm the center of attention, worried that others are judging my every move. Bullying is hurtful and wrong. It has the power to destroy and end lives, and is the cause of needless hatred and anger throughout our society. Being a kid or teenager is hard enough without facing bullying on top of everything else. It’s up to each of us to spread the message that bullying is unacceptable, to teach those who do it why it’s intolerable, and to let those who have suffered its effects know that a bully’s words do not accurately reflect their worth. That’s why I’m proud to link up with Teenage Bride to take a stand against bullying. When things get so bad that children are taking their own lives, isn’t that enough? When places that are supposed to be safe havens become places of torment, isn't that enough? When you can’t find relief even in the confines of your own home, isn’t that enough? Bullying has become a national epidemic, a problem in need of a solution. The boy who snapped and beat up his tormentor, then got suspended. The son who took his own life because of what kids were saying at school. The girl who took it upon herself to post a video on YouTube that got over 30,000 hits crying out for help. The celebrities making videos, letting kids know that it gets better. As bloggers, we have the opportunity to speak up and make a difference. 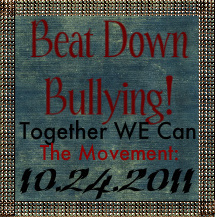 Link up with the Beat Down Bullying movement, and on 10.24.11, we WILL take a stand. Grab this button, and put it on your blog. Spread the word. Reach out and share your story. We can use our words for good, or we can use our words for evil. Join us, and use you voice for good. Together, we can beat down the evil of bullying. Did you ever encounter bullying? Will you help us take a stand? yes! have you read this? Heather thank you so much for linking up! I am so happy to see that your confidence and zest for life has led to you to such success!You are an inspiration. I was bullied a lot in high school. I definitely understand the dangers and effects of bullying. It made me a stronger person, but I am still firmly against it. I don't think kids should ever have to endure bullying. I was never bullied in high school but I know for a fact that is something very wrong and needs to STOP. Good for you to support a solution to a very important problem. Hi there- I'm a friend of Jessie and Jillian's who started this movement and I am so thrilled to see more people linking up with it. I did my link-up last week and it's so encouraging to see that you did too. I'm excited to be a new follower of this blog. More power to you! I wasn't bullied in high school, or ever really in terms of what I would consider bullying, but I definitely got teased a lot. Great post! This is a great post! I was bullied for most of my elementary school years - it caused me a lot of stress that translated into health problems. I'm so lucky to have had my best friend (who's still my best friend today) and my family for support. This is a really important cause so I think it's great you're taking a stand. I'm sorry to hear about your bullying as a child. I dealt with it too as a kid (one girl in particular bullied me for a couple of years) but luckily it wasn't too terrible. i've had instances of being bullied in middle and high school. it sucked.i'm glad there is more awareness now. time to take a stand for everyone. This is a wonderful issue you are highlighting! there are many children that experience bullying for no reason at all! This is a horrible and constant phenomenon. It is also one that produces long term and detrimental Effects if untreated. Thanks for keeping the issue alive!